I love purging. Not just the feeling of satisfaction of having more breathing space in my home, but I always find purging to be a wake up call to my spending habits. It helps me realize just how much money I’m “throwing away” on things I end up not using or liking in the end. 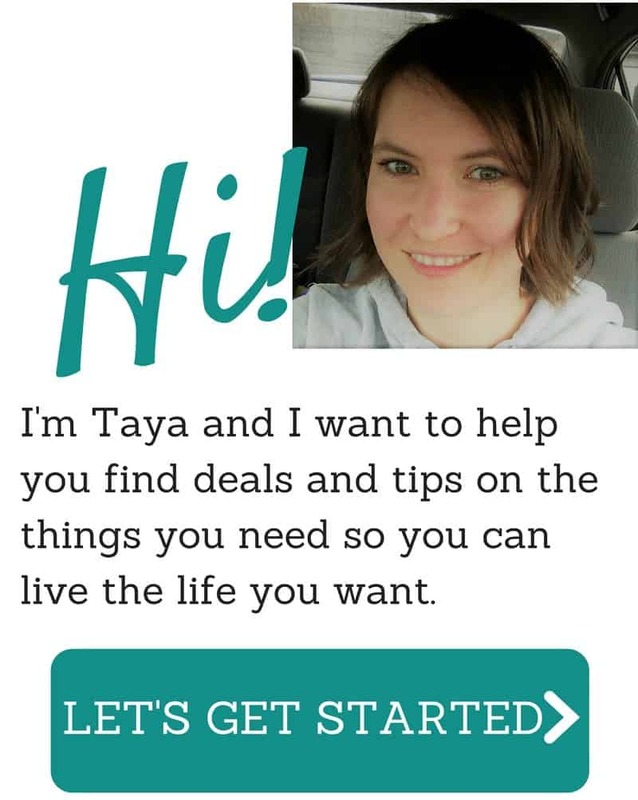 If you want to enjoy a calmer home and keep more money in your pocket (because you’ve realized how much you’re wasting! ), then I’ve got the perfect list for you! 31 Things you can purge this year. 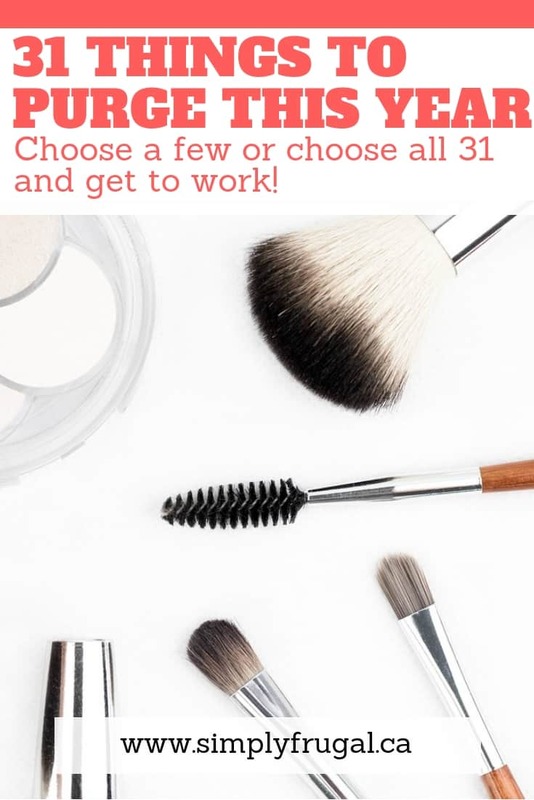 Choose a few or choose all 31 and get to work! Even if you just choose a few things off this list it will feel so good to lighten up! Most of these things are items none of us need but we hang onto “just in case we need it” and feel panic at the thought of letting them go. Out of date makeup– It’s just unsafe for your skin and eyes! Toss it out and treat yourself to a new lipstick or eyeshadow! VHS tapes– If you are still clinging to VHS it’s time to let it go, it’s not coming back. Old cell phones– Many electronics stores or phone companies have boxes for recycling cell phones and batteries where you can toss them. Spices that have expired– Check your cupboards and pantry, toss out old spices. Here’s an article with details about how long spices last. Non working electronics– If you haven’t dropped off the stereo or DVD player to be fixed and have no immediate plans to do so, just get rid of it. Old stretched out bras– Keep those comfy old jogging pants but stretched out bras are not doing you any favors. Plastic bags– While it is handy saving your grocery store bags for other uses, we all wind up with an excess of them that we just don’t need. Toss them in the recycling. Ragged towels and washcloths– If they can be upcycled for cleaning rags, cut them up into small pieces and find a new home for them. Otherwise get them out of there. Treat yourself to a new set if needed. Clothes that don’t fit– Clothes more than one size too small/too big should be donated or sold in a garage sale. Unused or duplicate kitchen utensils– 6 wooden spoons? 3 meat mallets? Unopened egg poacher? Clean it all out of those drawers! Books– If you have read it and won’t read it again or you didn’t like it then it’s time to clean off your shelves and nightstand. Single Earrings– If it has been in the jewelry box for a year with no mate, chances are it will always be a single, go ahead and set it free. Single Socks– When you are all caught up on your laundry go through your odd sock basket and match up, get rid of any without mates. Unloved toys– Donate or toss toys as needed. After the holidays kids have an excess and this is a great time to purge. Unused sports equipment– Ice skates from lessons from two years ago that have never been picked up again? Donate them. Dry basketball? Toss it! Items that don’t belong to you– If you have a spot that houses casserole dishes, borrowed books, etc waiting to be returned to friends and family that you borrowed from, go ahead and return it all asap! Paperwork– Junk mail, old bills, or other out of date filing. Grab an inexpensive paper shredder or toss them in the fire. Odd storage containers– You know that cabinet with plastic bowls that have no lids or lids that have no bottoms? Get in there and toss out mismatched pieces. Old linens– While towels may be cut down and used for rags in the garage, other items like sheets that either don’t fit or won’t be used on current beds, excess comforters (keep one spare) etc, can be purged. Blurry photos– If you have a box full of family photos through the years remove and toss the really bad ones, if that is the only one you have for an event you might keep it but otherwise just keep the best of the best. Ink Cartridges– If you have a stockpile of old empty ink cartridges you can find somewhere local to recycle or many places like Staples let you use them for credit towards new ones. Freezer items– Freezer burnt, well past their date, inedible or unappealing food should be tossed! Dried up pens– Take 5 minutes to go through the mug of pens on the desk or wherever else you keep them, test them all on paper quick and throw out the ones that are dried up or leaking. Manuals– I used to be one that kept every single manual/instruction book for every piece of equipment i owned, I had a drawer full of them and rarely ever needed to look at them. Then I realized that I could find them on the manufacturer’s website should I ever need them and I tossed those suckers out! Spare change– Unless you are saving up for something really big, It’s time to grab that change jar, clean out couch cushions, get that pile on the dryer and turn it all in. Treat yourself to a mani/pedi or a new top! Craft supplies– Take an afternoon to go through them and donate items you won’t use in the next couple of months to a Children’s program or somewhere else that could use them. Personal care items– Old perfumes, lotions,and shampoo bottles with 2” left in the bottom-get them out of the bathroom for good. Cards– Get in your wallet or purse and purge out customer loyalty, rewards cards, empty gift cards and the like. Pet toys– Toys that are shredded, dirty, and unplayed with should be tossed, just like kids toys they need to be purged and occasionally replaced. Boxes– Do you have a big collection of boxes somewhere, either packaging or packing boxes for another just in case? Clear them out and make room. Anything else that you would add to the list? Did you get any good ideas for a starting place?